Pandora 5.0: Avatar emulates Enterprise 2.0? So last weekend I was allowed to get away to see Avatar because it was my birthday, and I have to say it was pretty impressive visually. I would call the storyline predictable, but strong enough to support the special effects and definitely worth your while to go see. Strangely enough, while watching, a parallel between this movie and Enterprise 2.0 dawned on me…thus this blog posting.. WARNING: I’ll write this with the best intentions of not giving away significant story points for those that have not yet seen the movie, but if you have any trepidation of spoilers for this very predictable story, maybe it would be best to wait to read this until after you have seen the movie. 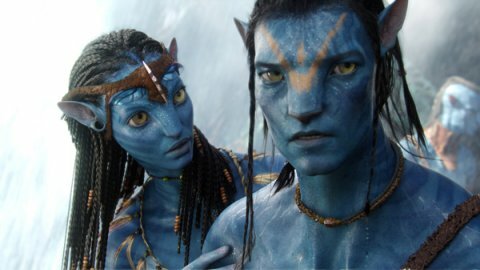 Avatar takes place on a moon named Pandora, and it is primarily inhabited by wild beasts and the indigenous Na’vi people (the very tall bioluminescent blue people from the commercials). But what is unique about this land is that there is a mysterious connection between all living things, including animals, plants, trees and the Na’vi. The inhabitants of the moon can “bond” with one another to share thoughts and the Na’vi people can “bond” with trees to hear the voices of those that have passed. Eventually we learn that the makeup of the moon is effectively a huge interconnected neural network and all living beings have common anatomy to be able to plug into that network and “bond” with each other. Pandora is one big Social Network, or better yet, an Existence Network. So, our main character Jake Sculley (who has been “matrixed” into a genetically engineered Na’vi body and dumped into the Pandora wild), uses his newly discovered pony tail with a mind of its own to “friend” his six-legged blue horse and his alien pterodactyl for public transportation. These connections between the living creatures on Pandora, and through the main source (the mother goddess, an all powerful tree named Eywa) are what help the moon thrive and the creatures to co-exist peacefully (except when satisfying their hunger by hunting, but always with utmost respect, of course). It isn’t that groundbreaking to see how an entire world thriving in a connected environment relates to Enterprise 2.0…even if the connections are biological instead of technological. Differing tribes and species that might not otherwise relate because of space and communication gaps collaborate in peace thanks to a common network. They work together in unison for the good of their world instead of fighting one another for supremacy. What I really found cool was how the natives of Pandora leveraged the Existence Network to overcome their invaders…money-hungry corporate Earthlings! This is the part where I may be delving into a little bit of a spoiler, so you may want to turn away now if you haven’t seen the movie yet…. Another parallel to the virtues of Enterprise 2.0 was when Jake tamed and then “friended” the fierce Toruk (a dragon-vulture the size of an F-16) to prove his commitment and skill to the Na’vi people after he had been exiled. Only five other Na’vi had ever tamed a Toruk. Jake’s demonstration of skill and influence over this treacherous animal was enough to gain the respect of the Na’vi people regardless of his position or status. There were going to follow his lead based on his accomplishments as a warrior. Leadership and influence within the network was earned, not appointed in his case. Watching the movie I couldn’t help but recall the concepts of 2.0-style collaboration were underlying themes to the feel good elements of this movie (although biological connections through a fiber-optic pony tail would be more like 5.0-style collaboration), and the primary weapons that gave the Pandorians an advantage over the command and control humans. Now don’t confuse this blog post as my undying commitment to using the movie Avatar as my “Real Business Use Case / ROI Example” for Enterprise 2.0…even I know better than that. But hey, who really needs extra excuses to write blog posts about cool movies and claim you are talking about work?